Mad Tommy Churchill - Website of reckersworld! Before he was part of Bad Company he was in Kano's unit. When the unit was captured by the Krool, he managed to escape while Kano was experimented on by the Krool. Tommy remained near the Krool encampment, sorting through the dead bodies of the Krool's victims on a regular basis to see if Kano would be among them. Finally Kano managed to break out of the Krool camp and Tommy aided him, tending to him while he recovered from his ordeal. He was the one who retrived part of a human brain and put it into the black box to help Kano overcome what the Krool had done to him. 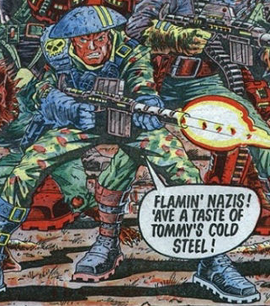 Tommy realised that Kano would likely kill him to protect the secret of the black box, so he began to act crazy, pretending that he was in World War II battling against the nazis. He hoped that by acting crazy Kano wouldn't kill him and it turned out he was right. Kano kept him alongside him as they added recruits to their new unit; Bad Company. Mad Tommy continued with his act, not letting on to any of the new recruits that he wasn't actually crazy. He was one of the few to survive the final battle or Ararat and it was then that he revealed his story to Danny Franks and Mac. Mad Tommy remained with Bad Company into the 2nd incarnation, but ironically it was Kano who ultimately killed Mad Tommy when he was suffering from Neuroflips and with the Krool (who had the other half of his brain) in control, he choked Mad Tommy to death. This was not the last we saw of Mad Tommy. Tommy returned as a ghost in Bad Company-Kano to aid Kano.